At the crack of dawn, the hum of pickup trucks disrupts the calm silence of the Blue Bay Campground. One by one, fishermen back their boats into the crisp, cold waters of Flathead Lake. They are ready for the day's first cast. Many anglers will spend the entire day fishing, leaving only when the dusk skies darken. During Mack Days, a month-long fishing derby every spring and fall, few leave disappointed. 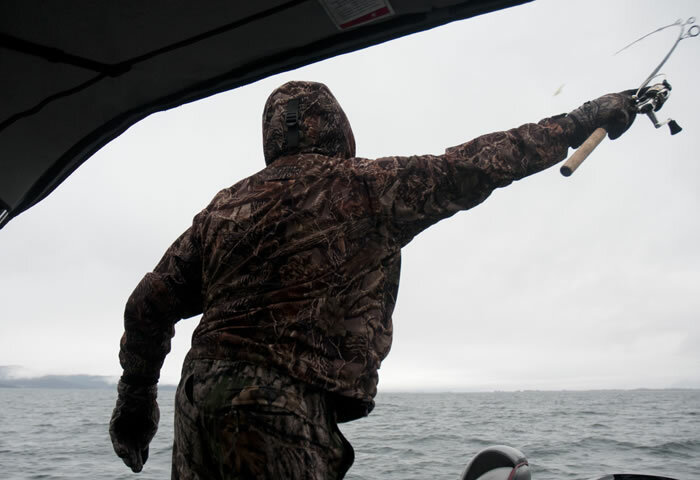 As they return to shore, they carry with them loads of lake trout—too many for one family to consume. Anglers bring their catch to a lakeshore cabin to be tallied. Hundreds of fish with silvery scales and beady eyes are placed on ice—their bellies swollen with air from the pressure of being pulled up from deep water. The fish will be filleted and distributed to local food banks. These fishermen's fortune is a symbol of good intentions gone awry. Francine Pierre and her sons Shane and Isaac peer over the edge of the docks at Blue Bay looking for any sign of fish. Lake trout, or mackinaws, have overtaken the massive body of water. They are a driving force in the dwindling numbers of native fish, such as westslope cutthroat and bull trout, found in Flathead Lake. For countless generations, it was the native bull trout that could be counted on to provide food in times of need. The bull trout has so much cultural significance to members of the Flathead Reservation's Salish and Kootenai tribes, it's been referred to as the grizzly bear of the water. Tribal fisherman Bill Swaney remembers when people could come to Blue Bay and catch bull trout. Today, he fishes out of the same bay and has caught more than 1,500 mackinaw. In all that time, he's hooked only one bull trout. "I know the fishery is way out of whack and I know in my lifetime there were people who came right down here and caught bull trout," he says. "It's nice to think at some point we could come out and catch a variety of species and not just lake trout." Swaney takes part in Mack Days, which the tribes sponsor to entice anglers to help control the lake trout population. Participants can win up to $150,000 in cash and prizes. Held since 2002, Mack Days has grown from an event that drew 80 anglers who caught 888 fish to a highly competitive derby that last spring saw more than 700 anglers haul in 12,651 lake trout. 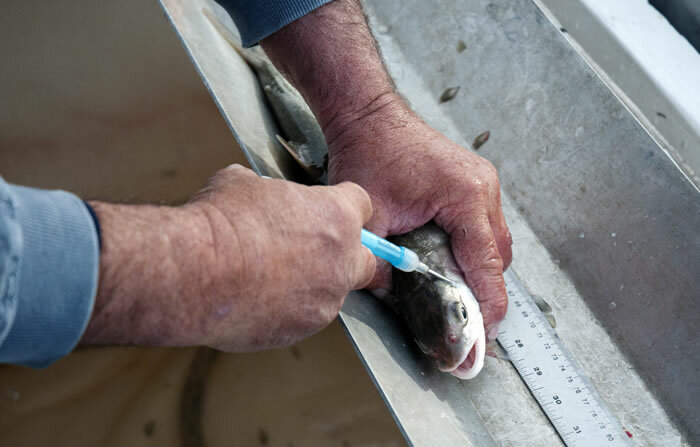 Rich Folsom tags a lake trout with an electronic chip that helps the Confederated Salish and Kootenai Tribes' biologists keep tabs on population estimates. During Mack Days anglers who catch tagged fish win cash prizes. Though more than 100,000 lake trout have been removed from Flathead Lake, tribal scientists say the fishing event has only managed to keep the numbers of threatened bull trout from further decline. Studies estimated bull trout in the Flathead Basin numbered about 20,000 in the early 1950s. The construction of Hungry Horse Dam in 1953 blocked off spawning routes for many of the migratory fish and by 1982 the estimated population had dropped to 13,000. Today fisheries biologists put the number at 3,000 adult bull trout. Lake trout populations are thought to be near half-a-million. Germaine White has dedicated countless hours spreading the word about the plight of bull trout as the information and education specialist for the Confederated Salish and Kootenai Tribes Fish, Wildlife, Recreation, and Conservation Department. The Salish-Kootenai woman has gray-black hair and her hazel eyes sparkle. As she speaks, a calm confidence quietly commands attention. 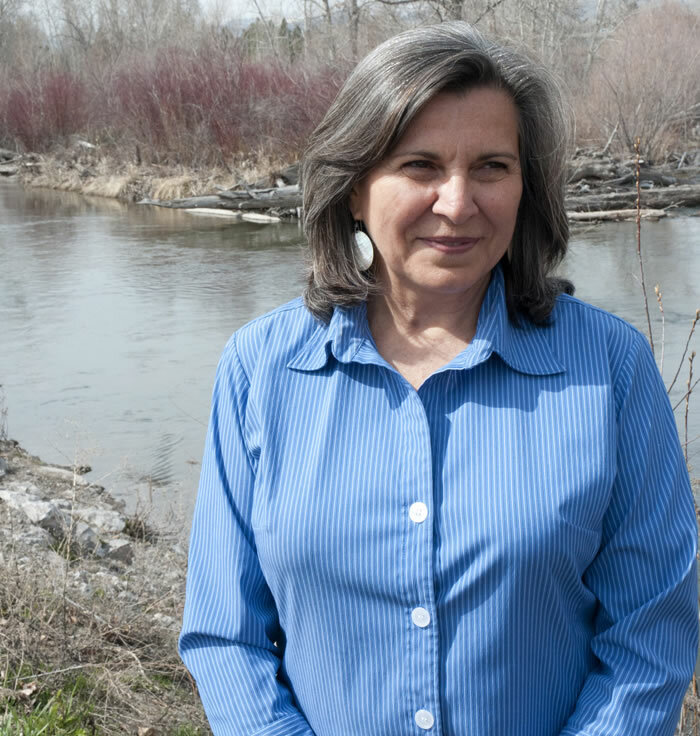 Thirty years ago, when her daughters were young, White moved to a home near Mission Creek. She took her children to the headwaters of the creek to watch bull trout swim, spawn and jump near the falls. "There are some things in nature you will always remember because they are so magnificent," White says. Today, there are no more bull trout in Mission Creek. 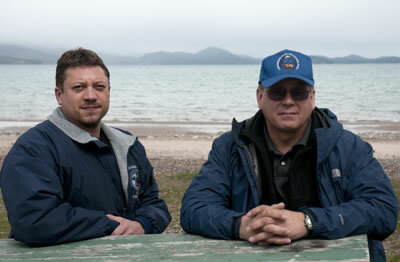 Confederated Salish and Kootenai Tribes Natural Resource manager Rich Janssen, left, and Fish, Wildlife, Recreation and Conservation division manager Tom McDonald sit by Flathead Lake. Bull trout are a sensitive species that need clean, cold water free of sediment, nearby trees and natural pools. This native fish can travel more than 100 miles to spawn. They have pink, orange and yellow spots, a square tail and lack the black dorsal fin markings of brook trout. In the past century, settlers have hurt the habitat bull trout need to survive. They've built dams, dug irrigation ditches, grazed animals and built homes along spawning streams. Non-native species have added new challenges to the fish's struggle to survive in Montana waters. Preserving and protecting native animals is on the top of the list of tribal members' natural resource efforts. Historically, the Salish, Kootenai and Pend d'Oreilles tribes were hunters, subsisting primarily on big game—bison, elk, moose and deer. They also dug food plants such as bitterroot and camas. But one reason the confederated tribes didn't have a starvation winter or a famine like some of the other tribes in Montana was an abundance of available protein—bull trout. "For the tribes that's been hugely important," says White. "We knew where the fisheries were, we knew where the streams were, where there were upwellings and the water was cold and there were a lot of fish. We knew how to deal with seasonal abundance and we knew how to take advantage of this high quality protein source." Preserving natural resources remains embedded in the way of life on the Flathead Reservation. A cooler of lake trout is ready for processing. 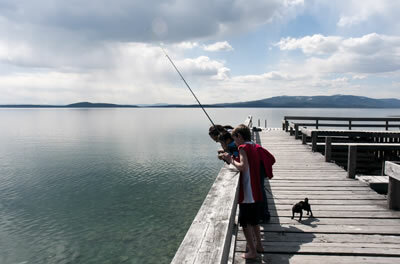 The fish were caught during the Mack Days fishing contest at Flathead Lake. Flathead Lake, the largest freshwater lake west of the Mississippi, whose southern half is inside the reservation boundary, continues to draw in new residents and droves of tourists during the summer months. Picturesque islands rise out of the deep, cold waters of the lake. On calm days the water reflects large pines and jagged rocks along the shoreline and mirrors the majestic Mission Mountains that tower above the valley. In the town of Polson on the south end of the lake, Tom McDonald works alongside White as the Confederated Salish and Kootenai Tribes' Fish, Wildlife, Recreation and Conservation division manager. McDonald has a big smile and outgoing personality, but when it comes to getting the job done, he's a no-nonsense kind of man. McDonald fished for bull trout as a young man with his father. He was taught how the fish were interwoven into the lives of his ancestors, who had witnessed the sheer number of bull trout in the Flathead Lake and River before Kerr Dam was built on the southwest corner of the lake during the Great Depression. Conserving native species isn't just a job for the fisheries manager, it's also a personal obligation. McDonald wants to make sure his children and grandchildren have the same opportunity to share the experiences he's had. Despite the many efforts of tribal scientists and managers, bull trout populations in some lakes, rivers and creeks on the reservation have disappeared. "Isolated populations have blinked out under my watch without the ability of me to stop or change it, because it was too late. So I lost," he says. "And I don't like losing." 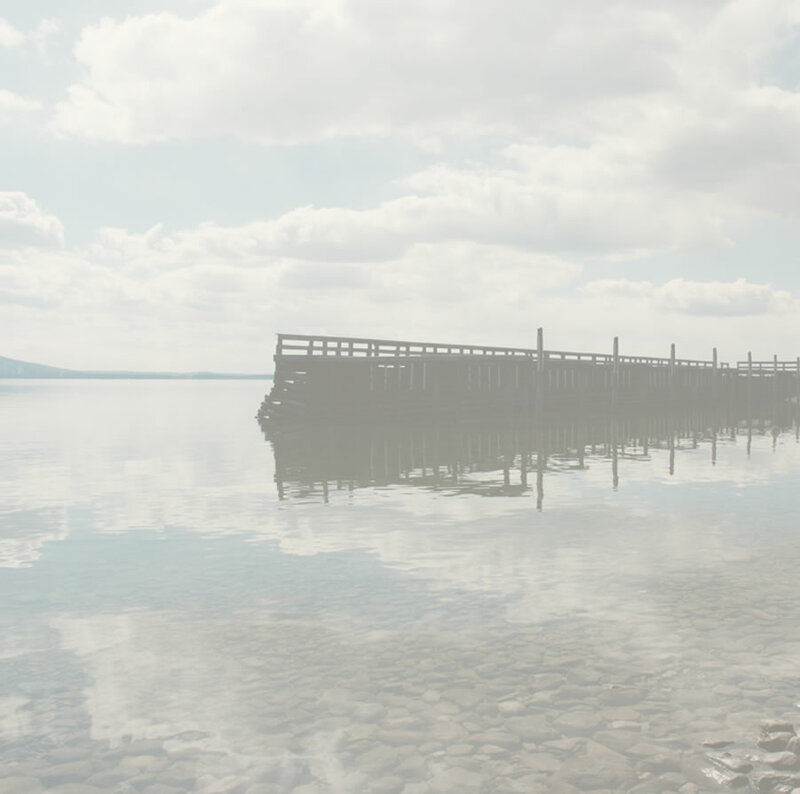 A dock juts into Blue Bay on Flathead Lake, the largest freshwater lake west of the Mississippi River. It's not something he's about to let happen again. Bull trout numbers have been dwindling for decades, but tribal scientists pinpoint the latest and most devastating crash of the bull trout population to the introduction of mysis shrimp. This mostly translucent, less than inch-long crustacean is also used for food in home aquariums. Between 1968 and 1976, the Montana Department of Fish, Wildlife and Parks introduced mysis shrimp into the tributaries of the Flathead system. By the 1980s, the tiny aquatic creatures had made their way into the lake. Mysis shrimp were thought to be a good food source for native trout, as well as kokanee salmon. But what was intended to be a win-win for native fish populations ended up turning the fragile lake ecosystem upside down. 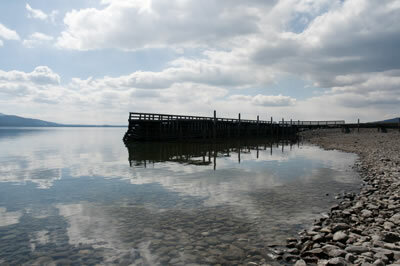 The shrimp live near the bottom of the lake during the day, exactly where young lake trout feed. And instead of being food for kokanee, the shrimp competed with the kokanee for zooplankton. Consequently, fish that were intended to benefit from mysis shrimp declined dramatically, while lake trout populations boomed. The kokanee salmon population, which was once the biggest fishery in Montana, became extinct. Bald eagles, which fed on the spawning kokanee, dissipated. Algae blooms blossomed because there were fewer zooplankton to consume algae. As lake trout feasted on the shrimp, their survival rate skyrocketed. Because lake trout are an opportunistic predator they will eat most anything they come across, including bull trout. Bull trout also eat other fish to survive but are out-competed by the massive number of lake trout in the system. 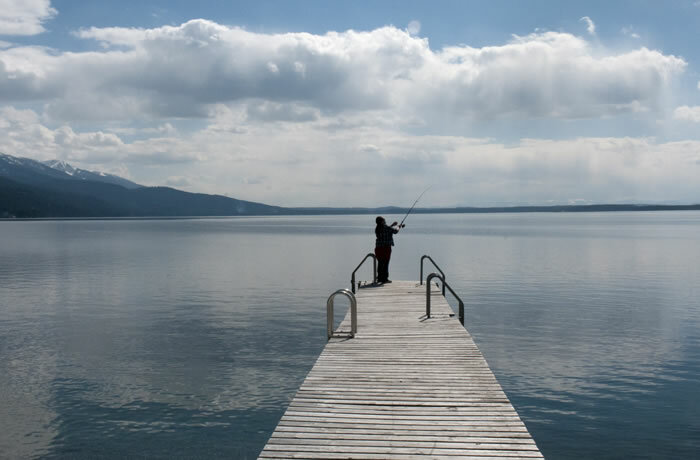 The collapse of bull trout in the Flathead Lake system contributed to the federal government's decision to list the fish as threatened in 1998. "Right away, the majority of scientists recognized the importance of doing something immediately," says McDonald. "They were on such a nosedive we were thinking it was almost too late." 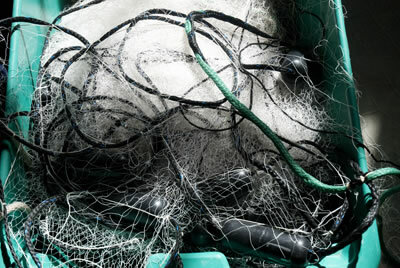 Netting used by biologists on Flathead Lake is held in a container. It will be examined and repaired if necessary. The Flathead tribes manage the south half of the lake while the northern half is state-controlled. The lake can't be divided down the middle, so the two governments came up with a collaborative plan to restore bull trout. In 2000, they started a 10-year joint management plan to restore the bull trout and westslope cutthroat populations. Although the tribe favored rapid reduction of lake trout, members of the public had other ideas. More than 90 percent of the 280 people who commented on the plan said they wanted a conservative conservation approach, while only a small minority favored rapid reductions of lake trout using aggressive methods like commercial fishing and netting. 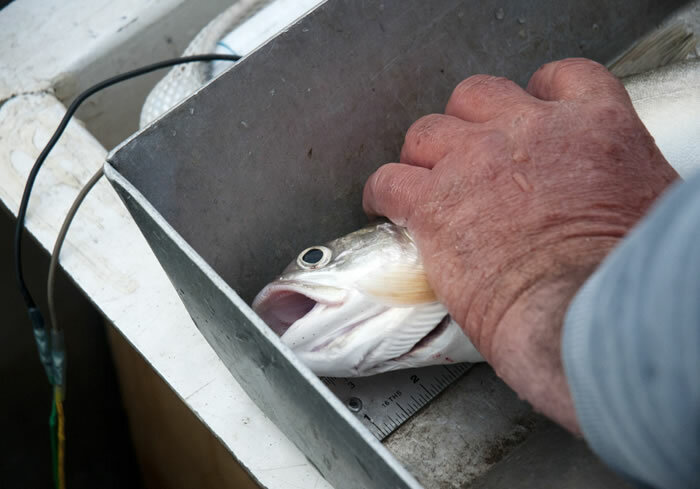 "Immediate actions weren't taken based upon the best science, due to the concerns of charter fisherman and other folks that have enjoyed lake trout, because it was a shock to them," McDonald says. Although plans for netting were delayed, the tribes continued their work to restore bull trout. They implemented Mack Days and completed major habitat restoration projects, including a multimillion-dollar project on the Jocko River drainage. The tribes restored habitat in and around the river, and bought land to keep the river healthy. "It's been a tremendous conservation effort," says Mark Deleray, a fisheries biologist with Montana Fish, Wildlife and Parks. Education has also been a major component of tribal efforts to conserve bull trout. The tribes published a storybook for schoolteachers to read in classrooms. This intricately illustrated, colorful book takes students on a field trip to the Jocko River to learn about the importance of bull trout. A field journal was created for older students and adults to record their personal experiences with nature on the Flathead Reservation, and an interactive DVD highlights the cultural significance of bull trout. "We can spend millions of dollars on restoration, but if the next generation doesn't understand how profoundly important it is, if they don't understand the gift of water and bull trout the elders have passed on to us, they will have no interest in restoration and maintaining this valuable project," says White. 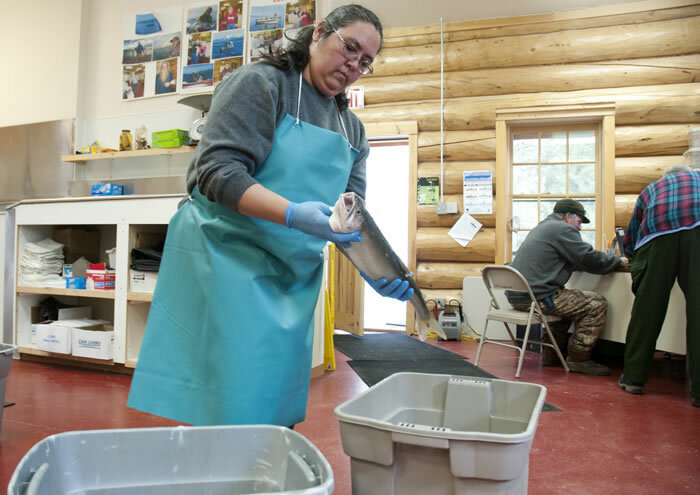 Tribal fisheries employees say with all of the strategies they've put in place, they're disappointed with the slow speed of bull trout recovery. Last year, the tribes introduced a lake trout netting plan, but during public meetings, they were pressured to hold off until other options could be explored and an environmental assessment could be conducted in accordance with the National Environmental Policy Act. "It's very frustrating," says Rich Janssen, the tribes' natural resource manager. "We came up with joint a plan with the state in 2000. Here we are almost 12 years later, and we are ready to move forward." "Those who are promoting the killing of all of these fish are ruining my business,"
FWP biologist Deleray acknowledges that collaboration has both benefits and drawbacks. Working cooperatively is not a new experience for either entity, but differences in opinion slowed progress on the bull trout recovery co-management plan. "In many ways we work together and are very successful. We have completed quite a bit of work that has benefited habitat and species," Deleray says. "In other areas we do have some disagreements that make it more challenging and generally progress slower." One group strongly opposed to removal of lake trout is charter fishermen. Commercial fishing is not allowed on the reservation's half of the lake, but about a dozen charter businesses operate on the lake's northern waters. 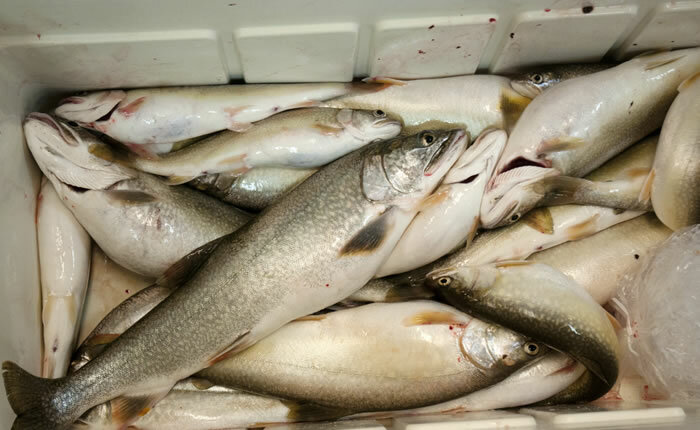 Lake trout are a major draw to their business. "Those who are promoting the killing of all of these fish are ruining my business," says Lakeside charter fisherman Patrick Campanella. He's a 30-year veteran fishing guide who has been charter fishing on Flathead Lake for about five years. In the few years he's been fishing on Flathead Lake, he says he's already noticed a decline in the lake trout catch. "They've already destroyed one fishery and now they are in the process of destroying another," he says, referring to the kokanee. If the lake becomes a single fishery even trophy lake trout would eventually disappear, McDonald says. That's not only bad for the Flathead Lake ecosystem, it's also bad for tourism and the economy, he adds. Tribal fisheries managers are sensitive about public opinion on lake trout removal, but are not about to give up on their management plans. "None of our plans are shelf art," McDonald says. "A lot of management agencies will go through the exercise, do it for a while and then forget about it. It's just another file on a shelf. We don't operate that way." An interdisciplinary team of tribal fisheries biologists and state FWP employees are analyzing what actions to consider next. Rich Folsom holds his net steady waiting for a young fisherman to transfer his lake trout. 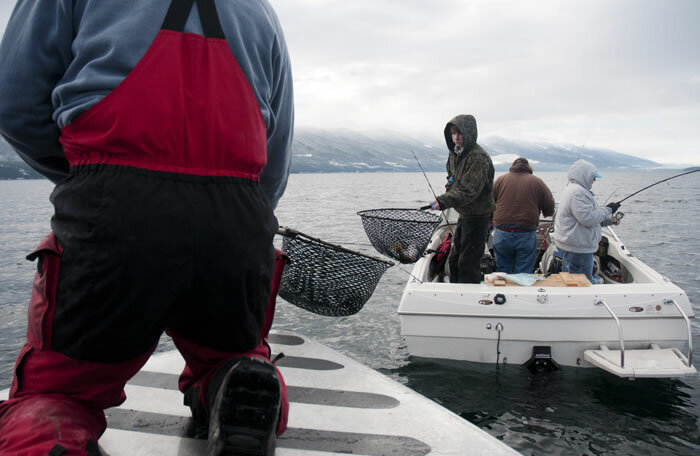 Fishermen donate their fish to be tagged and released back into Flathead Lake or for food for area food banks. One option is trapping live fish through a funnel system. This technique greatly reduces the likelihood of catching and killing native fish, but it's also expensive. Also on the list is gill netting. Netting is controversial because native fish can also get caught. However, McDonald says gill netting can be targeted and site specific to limit the number of desirable fish netted. It's also the most efficient and inexpensive way to remove lake trout, he says. Gill netting has been used for research in Montana but as a fish removal method the practice is fairly new. Although it's still not clear how many lake trout will be removed from Flathead Lake, it is clear that the tribe isn't about to let native bull trout disappear from the reservation. "It's part of who you are. It's part of your culture. It's part of your history," Janssen says. "You don't want to lose who you are. You don't want to lose that connection." Breeana Laughlin is a graduate student at The University of Montana School of Journalism. Megan Gibson is a senior at The University of Montana School of Journalism.